22 | October | 2011 | Strike of Lightning! Dead mans money more than $200 Billion? Moammar Gadhafi secretly salted away more than $200 billion in bank accounts, real estate and corporate investments around the world, about $30,000 for every Libyan citizen and double the amount that Western governments previously had suspected, according to senior Libyan officials. If the values prove accurate, Gadhafi will go down as one of the most rapacious as well as one of the most bizarre world leaders, on a scale with the late Mobutu Sese Seko in the Democratic Republic of Congo or the late Ferdinand Marcos in the Philippines. Obama administration officials were stunned last spring when they found $37 billion in Libyan regime accounts and investments in the United States, and they quickly froze the assets before Gadhafi or his aides could move them. Governments in France, Italy, England and Germany seized control of an additional $30 billion or so. 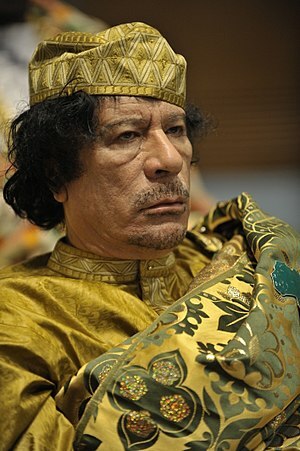 Investigators estimated Gadhafi had stashed perhaps $30 billion elsewhere, for a total of about $100 billion. But subsequent investigations by U.S., European and Libyan authorities determined Gadhafi secretly sent tens of billions more abroad and made sometimes-lucrative investments in nearly every major country, including much of the Middle East and Southeast Asia, officials said Wednesday. Most of the money was under the name of government institutions such as the Central Bank of Libya, the Libyan Investment Authority, the Libyan Foreign Bank, the Libyan National Oil Corp. and the Libya Africa Investment Portfolio. But investigators said Gadhafi and his family members could have had access to any of the money. U.S. federal agencies noted a “growing nexus” between Mexican drug cartels, with traffickers or smugglers and gangs based in U.S. territory, according to information from an FBI report. ‘The typical illegal immigrant now pays between 200 thousand and 500 dollars for their entry into the U.S.. The rate is much higher for the smuggled aliens from countries other than Mexico, which is more attractive to the cartels’, he said. ‘It is estimated that criminals obtain billions of dollars each year for smuggling aliens through Mexico to the United States’, according to information cited by the Federal Bureau of Investigation (FBI), obtained from the National Security Committee of the House of Representatives. The National Assessment of the Threat of Gangs until last April estimated that the U.S. had 33,000 of these national groups with a membership of 1.4 million people. ‘The gangs continue to expand, evolve and become more violent’, acknowledged the deputy director of the Criminal Investigation Division of the FBI, Kevin Perkins. The report documented the evolution of criminal activity including greater involvement in ‘non-traditional crimes’ and trafficking, alien smuggling, crimes and white-collar as forgeries, identity theft and mortgage fraud. “The gangs are becoming more adaptable and sophisticated, using new and advanced technologies to facilitate criminal activity, increase their criminal operations and connect with other gang members,” the FBI said.